A friend of mine asked me that question recently. If the question had been about my artistic lineage I would have said my grandmother on my mother’s side. She hand-painted towels and sheets with decorative flowers and birds. Not strictly necessary on the farm but beautiful customization of a permanent pressed white sheets. The question was about photography however. To this, I answered, “My grandfather on my father’s side.” The question and the answer got me curious about him. You can see him here. I remember my grandfather (much later) looking down into the waist level viewfinder of the Twin Lens Reflex, a camera that was introduced in 1928. The Brownie (1988) would have been available during his growing up years, and, in 1923, according to the app History of Cameras by Yural Perlov, the Oskar Barnack Leitz Optische Werke (Leica) was out at specialty prices. He and his wife had a darkroom in the basement. 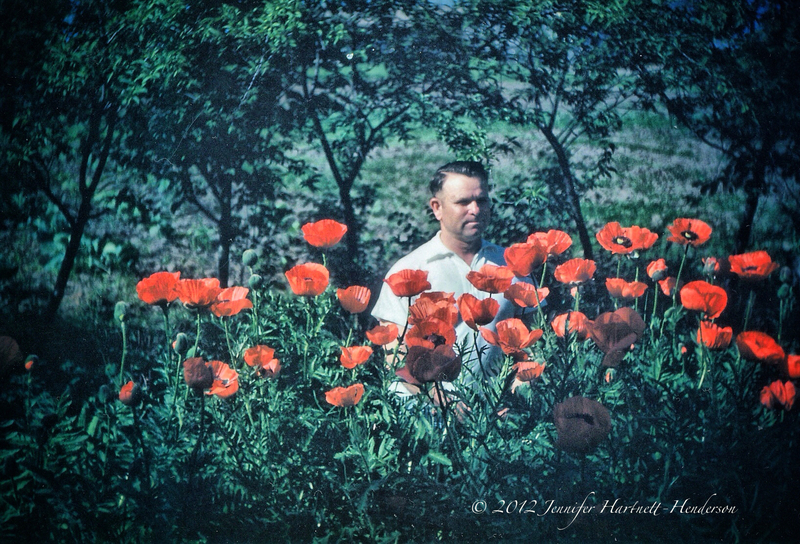 He was known to shoot his sons’ football games and his wife, my grandmother, hand colored some of the portraits he made. I wondered what else I could learn from this photo. Who took it? It is carefully composed. In a family snapshot, odds are that one of the five young sapling trunks would have been growing out of the back of his head. Instead, he is calmly centered between the middle two. There is a clear foreground, middle ground and background almost like a painting with the atmospheric effects of f5.6 or so providing an out of focus background. The angle of view is neither above his head nor below. Was this a self-portrait taken on a tripod? Why poppies? 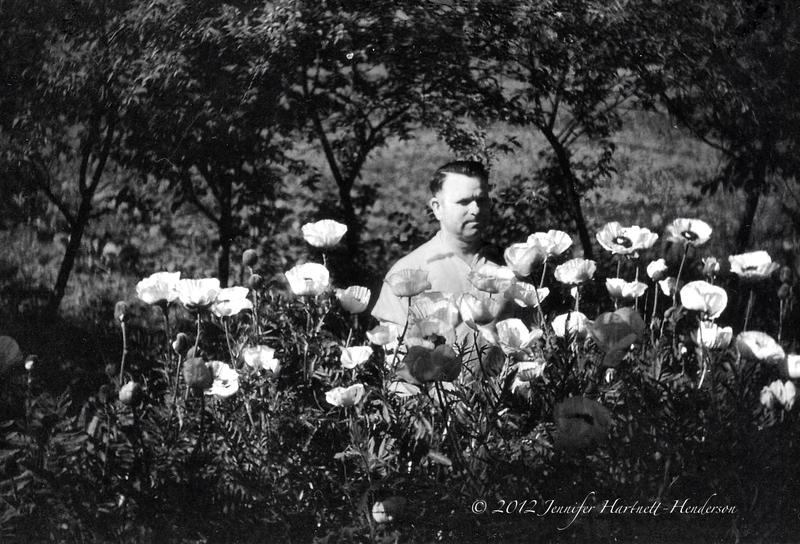 Why did he grow poppies? My grandfather was an avid vegetable gardener his whole life so the setting makes sense but red poppies seem an odd selection, exuberant, passionate, almost. 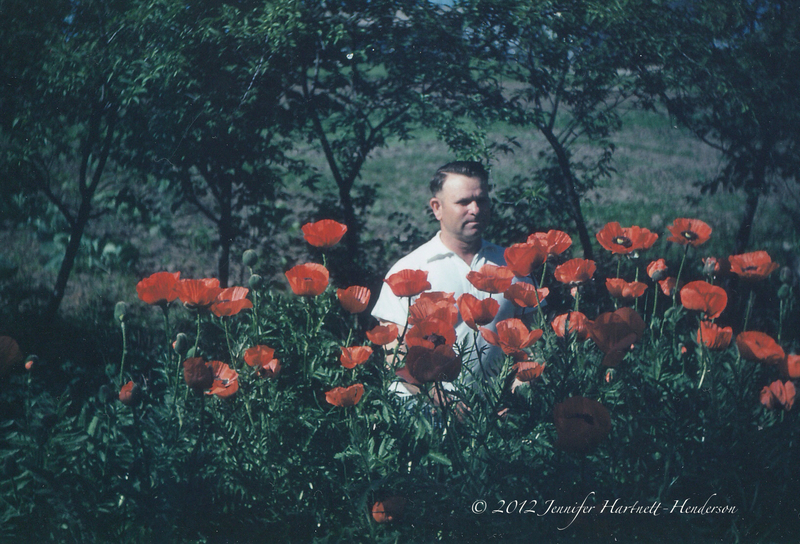 Grandpa was not a tall man being just over 5’ and his head and shoulders are above the poppies so they are about 4’ tall. Their height, clumping habit and erect growth most closely resemble P. bracteatum in contrast to the shorter varieties. It’s very likely May or June, the time when these flowers bloom. Their requirements for full sun, well-drained soil and are draught tolerant are a perfect match to Kansas weather where he lived most of his life. Why red? Red was the only color available until 1906 when pink was accidentally found and then white in 1913. If this photo was taken in the 1960s, then these were either an extremely old clump of red poppies (some have lived for 80 years) or they were a purpose planted patch radiating drama and exuberance. After this forensic tour of a photograph of grandpa, I feel more connected and I look at this photograph differently, as if there is more light. I feel both like a piece has fallen in place in family history and that I have more questions. Now when I look through family photos, I’ll be asking about what’s outside the frame as well as who is in it. When did they take the photo? Why did they take it? Who took it? What did they take it with and why? It’s a long way to travel from “Who is in your photographic lineage?” through camera history, poppies and 1940s fashions to revamping the way I look at photos. Maybe these questions could be useful in your journey too. Who in your family is in your photographic lineage? What can you learn from making that connection?